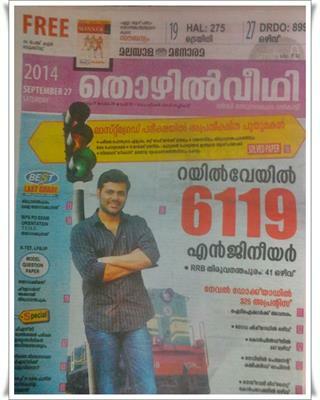 The leading employment newspaper Malayala Manorama Thozhilveedhi has published its 27th September issue. The latest edition of 'Thozhilveedhi' comes with rising prospects and job opportunities in various fields. In the 27thth September issue of Thozhilveedhi, vacancies in Railway, RRB, Naval Dockyard, Goal Shipyard, Coal Field, HAL, DRDO, Hindustan News Print,Spices Board and Nayveli Lignite Corporation are also reported. While going through the pages, readers can find new job prospects like 6119 Engineers in Railway, 41 opening in RRB, 325 Naval Dockyard, 87 in Goa Shipyard, 347 in Coal Field, 275 in HAL, 899 in DRDO, 50 Attendant Trainees in Hindustan News Print, 6 in Spices Board, Guest Faculty in Central University, Permanent Commissioned Officer in Navy and opening in Nayveli Lignite Corporation are also reported. Solved paper of Last Grade Servant held at Thiruvanthapuram and Wayand are given for reference. This issue would also leverage the studies of candidates who are preparing for the exam in other districts. Last Grade Crash Course, Combined Defense Services Examination, SSC Exam Orientation are also given with prominence. The K- TET Model Question Paper prepared by Florence Academy Anchal would help the candidates to brush up their last minute groundwork. Articles on various topics including Kerala PSC online examination, , regular columns like Open Forum, PSC for Beginners, Syllabus of various upcoming Kerala PSC exams and Hall Ticket details are featured in the current issue. Doubts of the readers are also cleared by concerned PSC officers. The current issue of Thozhilveedhi can be utilized to get extra benefit. Thozhilveedhi is accompanied by 'Competitive Winner', a free booklet which is highly packed with latest General Knowledge in capsule format. This miniature general knowledge text had proved to be a companion for job seeks who are looking for an extra mileage in their performance. More than an employment magazine, 'Thozhilveedhi' has become an exclusive platform for youngsters and has enlightened them to learn more and build a strong career.